Altmetric ranking for de Freitas et al in January. Current Altmetric ranking (click SCORE IN CONTEXT on SUMMARY tab then click a category for details). Click to enlarge. 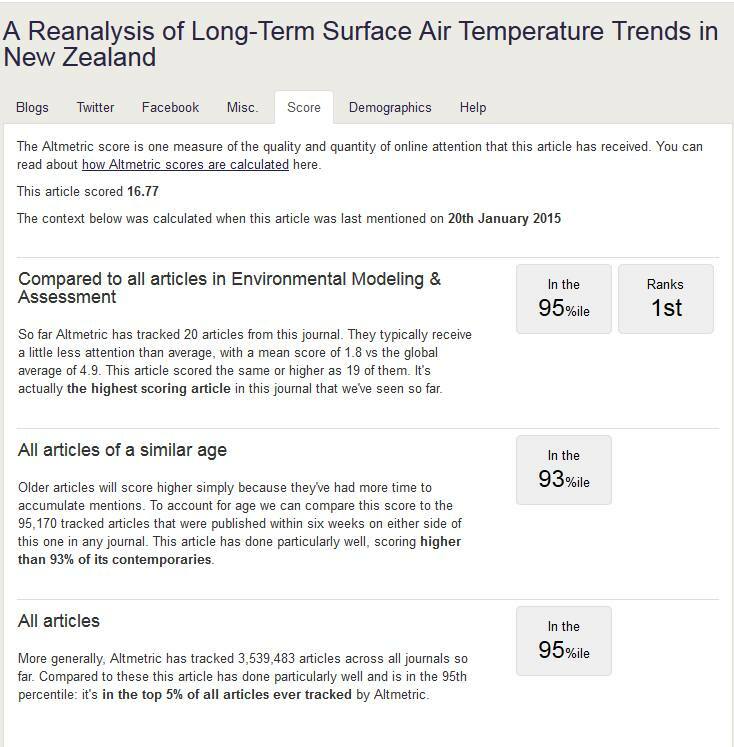 I am delighted to report that A Reanalysis of Long-Term Surface Air Temperature Trends in New Zealand (de Freitas, Dedekind & Brill, 2014) is top-ranked by Altmetric. Altmetric has tracked 20 articles from EMA, the journal our authors used, and our paper tops them all. More significantly, it ranks in the top 5% of all 3,671,975 articles ever tracked by Altmetric, and in the top 8% of 102,471 articles published around the same time. It’s an outstanding result. “What’s Altmetric?” I hear you ask (just as I did). Altmetric ranks scientific papers according to their mentions in social media. They say this gives a more realistic view of a paper’s influence than counting traditional citations. The lead author, Chris de Freitas, is an associate professor in earth sciences at the University of Auckland, and is abundantly helpful with scientific advice, though he’s not a member of the Climate Science Coalition. Bob Dedekind plays a prominent role in the science and often beavers away on tedious but essential calculations that nobody else wants to do. Barry Brill is the Coalition’s chairman and legal advisor, and spends uncounted hours behind the scenes on Coalition business. All three men lead busy lives and all are generous of their time and expertise. I take my hat off to them, not least because in a project that challenges the mainstream, United Nations view of this sinful man-made global warming, they risk severe public disapproval. The paper was accepted by Environmental Modeling & Assessment (EMA) in October last year after what seemed like endless revisions before the reviewers were finally satisfied. So now, when we’ve just been advised the paper will be printed in the August edition of Environmental Modeling & Assessment, we can also report it is near the top of the new Altmetric ranking system. This is just the second peer-reviewed paper published on the NZ temperature record and it’s the only one to use Dr D.A. Rhoades’ improved statistical methodology, described by him and Dr M.J. Salinger in 1993 (R&S93). NIWA has had over 20 years to take advantage of those improvements and provide Kiwis with a more accurate temperature record, but they ignored the new methodology developed by their chief climate scientist. Though they sometimes claim to have used it, they changed it beyond recognition. Now the study has been properly done for them, and how deeply ironic it is that by using Salinger’s own improved method his exaggerated warming influence on the New Zealand temperature record—an extravagant 0.91±0.30 °C per century over the last 100 years—is deflated by about 70%. Perhaps that is why NIWA never wanted to use it, though a better question is why Salinger himself never used it. So how much has New Zealand really warmed? This new paper shows warming of a quite unremarkable 0.28±0.29 °C per century. There is no cause for concern. We should see Salinger’s 0.9°C warming in the proper perspective. Not long after he wrote his thesis in 1981, the IPCC’s TAR reported global warming during the 20th century of about 0.6°C. That meant that Salinger was claiming New Zealand had warmed a good 50% more than the rest of the world—even though NIWA tells us we have a maritime climate, buffered by the ocean. In other words, less extreme temperatures than the middle of a continent. Salinger’s claim of extreme warming in New Zealand, with no effort on his part, took less than 26 years to become ho-hum and oh, so normal. How? Through the ex post facto adjustments to global temperature records around the world that would be enthusiastically embraced by the IPCC. Because compared with the growing IPCC global temperatures, the man-made warming he concocted by adjusting the data looked less and less outlandish. So Salinger’s radical, artificially heated Trojan Horse of the South Pacific in 1981 had successfully invaded the world’s climate reality by 2007. The young Jim Salinger, all unbeknownst by most of those around him, proved the sharp end of a quite revolutionary lance. Just to mix the metaphors. Many are puzzled as to how we didn’t notice at the time how hot it was. But of course that’s silly, since it’s the present, not the past, that’s supposed to be over-heated. At a time when adjustments to old temperatures make people yawn and nobody knows what to believe, this paper starts to claw back some ground and provide an authentic national temperature record people can trust. Because it’s not rocket science. This paper was featured last year in a complimentary review at CO2 Science. Well that’s bound to leave a stain. Surely the govt. might start to reconsider who they’re funding once the dust has settled. I can almost hear the gnashing of teeth from here. Although I suspect that the likes of Justice Geoffrey Venning are hardly likely to be influenced by “mentions in social media”. Then again, Venning wasn’t influenced either by the original ‘Statistical Audit’ when it was the core evidence in his court hearing of NZCSET v. NIWA. Some people take inordinate influencing, unless of course the influence is Dr Brett Mullan, NIWA. I have made repeat discoveries over many years regarding the actual ignorance and downright stupidity of the legal profession and the judiciary, which appears to be a natural repository of bias among those whose very expensive education should have a more positive effect on their thinking and their ability to reason when taking evidence into account. Justice Venning is just a random sample of his peer group. Google Scholar suggested that this paper has only ever been cited by one other, a paper on rainfall at Cape Otway by Jennifer Marohasy. You make it sound like the paper was published years ago Simon. Not quite 9 months in the literature. And do you REALLY expect CRU to cite it, for example? They SHOULD eventually though, given CRU adopt 7SS/11SS for CRUTEM4 and the version they adopt (NIWA) is substandard according to deFD&B14. Which has not been rebutted or commented on in the literature yet either i.e. the paper stands on its merits, which probably explains its popularity. Puts one Michael James Salinger in an invidious position. His co-authored paper being the established methodology on which deFDB14 was published. Possibly why M.J. Salinger hasn’t rushed to print via the climate journal fast-track route, as would be the normal course of events. That’s one citation I don’t think we’ll see. Be a hoot if we do. But not typical I don’t think Alexander, more like an exception. I think he was ranked down at 38 or something low at the time of NZCSET v. NIWA (could be wrong). Nicknamed “G-man”; an obvious play on Justice Venning’s first name but also reflective of the judge’s tendency to put the interests of the State bureaucracy ahead of the law and open justice. One well placed barrister, who has appeared before the judge often, characterises Justice Venning’s conflicting attributes aptly, “He hasn’t met a law yet that he couldn’t breach with a smile on his face.”Justice Venning is very clever. He is also prone to instill personal bias into proceedings by setting subtle traps for counsel. Fearless promoter of Crown interests, Justice Venning has changed dramatically in the years since his appointment. In his early years he was very cognizant of appearing to be fair from the bench.Justice Venning can be audacious in pursuit of personal interests which conflict with his judicial funtion. These conflicts of interest in cases over which Venning J has presided are unrivalled even for New Zealand. Between 2010 and 2012 Venning J faced three major scandals as a result of alleged conflict of interest and bias. In 2010, his failure to divulge an outside directorship and investment in a forest tax shelter became public. Three businessmen filed complaints with the Judicial Conduct Commissioner in relation to Venning J’s refusal to disqualify himself from presiding in Muir v Commissioner of Inland Revenue in 2005. which concerned a competing forestry tax shelter. In response to the misconduct complaint, the Judge claimed ignorance of s4(2)A of the Judicature Act, which requires judges not to hold outside office without permission of the Chief High Court Judge, claiming other judges are equally guilty. In September 2012, Venning J ran afoul of climate change opponents who alleged Venning J’s personal financial investment in an Emission Trading Scheme which sells carbon credits for profit precluded his presiding over judicial review proceedings brought by New Zealand Science Education Trust against the National Institute of Water and Atmospheric Research (NIWA). The claim challenged NIWA conclusions and sought public release of research documents. Venning J dismissed the application. In November 2012, Venning J summarily dismissed a breach of contract and Fair Trading Act claim brought by developer Warren Taylor on application of the defendant Bank of New Zealand by evading the pleaded facts and evidence. To discourage appeal, Venning cleverly stated his “analysis” was sufficient to grant the defendant a strike out of the claim if summary judgment proved unavailable, before adding he would additionally order security for costs of $25,000 against Taylor if he was able to overcome the judgment bar to sue the BNZ. This resulted in a further complaint to the Judicial Conduct Commissioner that Venning’s personal conflicts resulted in contravention of the plaintiff’s elementary rights to be heard. In 2007, in an appeal case which has become the standard in New Zealand in evaluating judicial conflict of interest, the Court of Appeal determined Venning J’s conflict did not rise to the level of disqualification. Details surfaced later that this ruling was unsafe due to a failure of Justice Venning to disclose his full interest to the Court of Appeal. Some of Venning J’s judicial colleagues fear he is a loose cannon but feel powerless to challenge him because he knows to much of the courts’ dirty laundry and is considered smart and brazen enough to dish out the scandal if personally challenged. Neither a random selection to preside over NZCSET v. NIWA, nor typical of his peers I don’t think. Richard C – thanks for digging that up re Venning. It is disturbing, but shows the NIWA dismissal in a more complete light. I guess we will now be accused of ‘conspiracist ideation’ by the usual suspects who go on about our big oil sponsorship. Zounds! The judge’s behaviour is painted here as an orchestrated litany of, err, ingenuity. Not bad, for a paper that technically hasn’t been published yet. Journals have taken to putting papers online post-acceptance but pre-publishing. In the old days you had to wait for the actual hard copy journals to be sent out. The online citation differs from the final hard copy one, which takes precedence once it appears. “A Reanalysis of Long-Term Surface Air Temperature Trends in New Zealand’ has now been published in the following paginated issue of Environmental Modeling & Assessment: Volume 20, Issue 4 (2015), Page 399-410. So that is now the correct citation. Note that Vol. 20 Issue 4 of EMA is due out in August 2015, still a month away.